Christmas isn't the same Christmas when living abroad. I'm far away from family and most of my friends. This means I don't have the obligatory office parties, attendance at my niece and nephew's string Christmas performance or the need to avoid the never ending parade of cookies. I'm not spending time out shopping for gifts or fighting for parking spots. It is a very different life from that in the States, and it is so refreshing. In the five years I've lived in Belgium, I've never returned to the States for Christmas. I've headed back each year for Thanksgiving, but Christmas is tough with December training camps and January training camps/races. In addition to the logistical challenges, I simply love the holidays here. Gent is already a magical place year round. Add in Christmas lights, Christmas markets and glühwein, and I'm obsessed. The first year I moved here, I was a little concerned about having Christmas so far away from my family. Would I be lonely? I was living in Oudenaarde and we went out to an amazing Christmas Eve dinner at Margaretha's. It was several courses, and they timed it so everyone left soon after midnight. When we walked outside, it was snowing for the first time of the year. It was that magical, flurry snowflakes that you see in movies. I knew Christmas in Belgium would work for me. With all my travels lately, I arrived in Belgium on the 15th of December and had nearly zero holiday spirit. I think it was all the warm weather places. I've never had Christmas somewhere warm, so it felt more like mid-June than two weeks before Christmas. I hadn't been wearing scarves, gloves or furry boots. There was no Jingle Bells or Silent Night. I've spent the past five days pouring myself into Christmas. I put up lights and stockings, bought extra bottles of bubbles, double-checked our holiday dinner reservations. I spend each morning as long as possible in my warm, soft winter pajamas. All that was left was locating the perfect living tree or bush to bring inside the apartment. We settled on a Christmas shrub that we plan to move out onto the patio following the holidays. 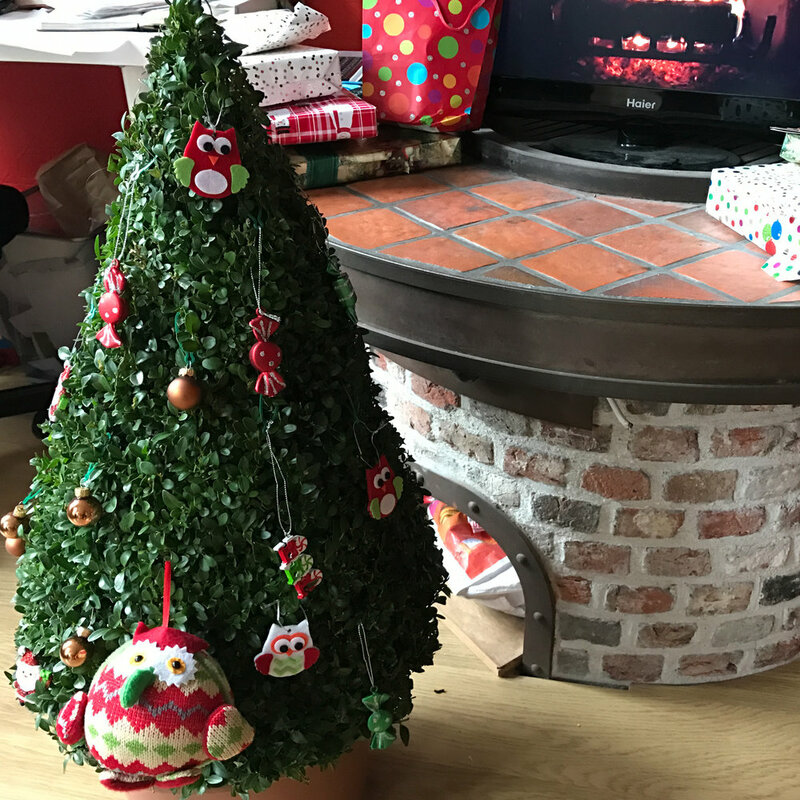 Hopefully, it'll survive the transition; I never like buying and then discarding/killing a tree or plant just for my enjoyment around the holidays. Now I'm ready to celebrate!